White Seabass (Atractoscion nobilis) | Better Know a Fish! 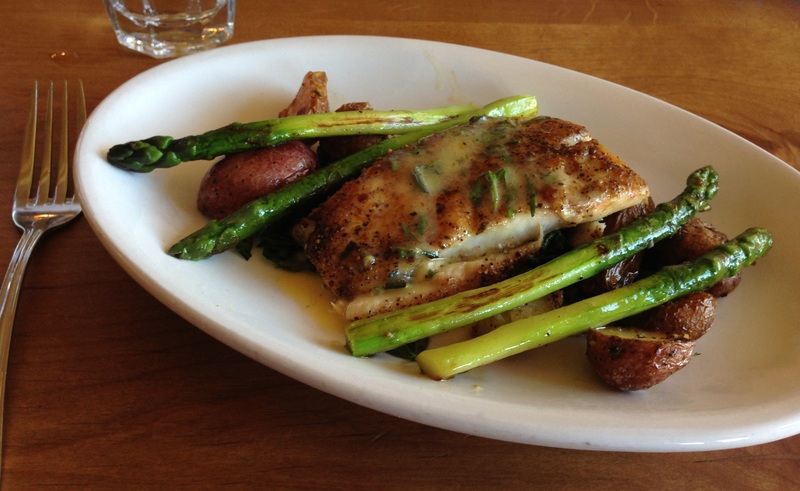 A surprise lunch outing at one of our many great local bistros in Sacramento, California, yielded its own surprise — a “white bass” listed on today’s specials. But being in California, there was a chance that this “white bass” was actually referring to Atractoscion nobilis, better known as “white seabass”. This is an unrelated, marine species found along the Pacific coast of North America, and a much larger creature — as you can see below — growing up to 93 pounds (42 kg). I had a feeling that the restaurant was offering white seabass, and ordered the special to find out. The cut (as you can see in the top photo) looked like only half of a fillet, probably from the dorsal (top) half of the fish. But this cut easily measured 5 inches (12 cm), meaning the original fish measured at least twice that length from belly to top — at least the girth of a big pineapple. This fillet probably came from a large fish. The flesh itself was moderately firm, juicy with a very sweet, clean flavor, reminding me of redfish (Sciaenops ocellatus) I have tasted in the eastern United States. Which would be fitting — redfish and white seabass are both large species from the family Sciaenidae. I got the clues I needed to make my best guess, and thanked her with a smile. White seabass. Now, compare the white seabass with another member of the drum and croaker family we explored recently — the spotted drum (Equetus punctatus). One is a humongous beast nearly the size of a human, cruising in schools in kelp forests, while the other is a wildly patterned tropical fish hiding about in coral reefs. Amazing how one type of fish can adapt and evolve into such widely different forms! Sounds like a pasture full of cows! For those of you not sensitive about watching a speared animal in its dying moments, here is a clip of a white seabass croaking after being speared. Drums and croakers produce these sounds by activating muscles near their swim bladder — an air-filled organ found inside many fish that help them maintain buoyancy, so they do not sink or float too quickly when they stop swimming. Contraction of the muscles cause the swim bladder to vibrate and generate sounds. A seemingly exhaustive overview of sound production in Sciaenidae can be found in Ramcharitar et al. 2006. Male white seabass are the crooners — singing of course, to the ladies. Male white seabass sound production peaks with spawning season, possibly to help individuals of the same species gather into spawning groups, and for males to attract females within those groups (Aalbers 2008). Researchers have observed five different types of sounds — “thuds” and “drumrolls” among them — including a “chant” that happens when male fish release sperm into the water, possibly as a signal to females to synchronize the release of their eggs, so they can mix with and be fertilized by the sperm (Aalbers and Drawbridge 2008). There’s even research looking into using underwater sound recorders to detect and track white seabass sound patterns (Aalbers and Sepulveda 2012). Given its popularity for food and sport, recreational and commercial fishery for the white seabass is managed in the State of California. If acoustic recorders can help detect peaks and patterns in white seabass courtship sounds — and thereby alerting fishery managers to high spawning activity — fishery managers can design optimal harvesting policies that protect white seabass during their peak spawning periods, while satisfying the needs for sportfshing and commercial fishing during other times of the year. Phew. How did we get talking about fishery regulations and fish mating calls? Oh right, from a “fish of the day” special scrawled on a restaurant chalk board. Aalbers, SA. 2008. Seasonal, diel, and lunar spawning periodicities and associated sound production of white seabass (Atractoscion nobilis). Fishery Bulletin 106(2): 143-151. This entry was posted in Actinopterygii, Marine Fish, Perciformes and tagged Atractoscion, Atractoscion nobilis, foodfish, gamefish, Pacific Ocean, Perciformes, Sciaenidae, sportfishing, white seabass. Bookmark the permalink. Pingback: Rockfishes (Sebastes spp.) | Better Know a Fish! Pingback: Spotted Seatrout (Cynoscion nebulosus) | Better Know a Fish! Pingback: Branzino (Dicentrarchus labrax) | Better Know a Fish!